To mark the 10th anniversary of the delivery of the first Qantas A380 in September 2008, today’s Throwback Thursday (TBT) features are republished from our November 2008 issue’s indepth coverage of the arrival of the first of the Flying Kangaroo’s super jumbos. Long before the first Qantas A380 touched down on Australian soil, its crews were well versed in the ways of the massive Airbus flagship. A pivotal reason for this state of readiness was their training in the state-of-the-art CAE full motion simulator. Volunteering to climb aboard a flight simulator under the watchful eyes of two senior training captains on a rostered day off is not generally regarded as ‘normal’ behaviour for a commercial pilot. However, when the aircraft involved is the newly arrived Airbus A380 and one’s licence renewal isn’t on the line, this is a case of pleasure rather than pain. And the pleasure began from the moment Qantas Captains Andrew Foxton and Rob Ford opened the door to the massive flightdeck of the A380 simulator. These generous dimensions are afforded by virtue of the actual flightdeck being positioned ‘between levels’ with its floor space dictated by the width of the main deck below. It is so large in fact that the physical dimensions of the simulator’s flightdeck had to be trimmed aft of the instructor station so that it would fit in a normal simulator bay. This sense of space is further enhanced by the wrap-around visuals that offer 200 degrees of viewing in the horizontal plane and 40 degrees vertically. Access to the pilot’s seat is effortless without a low slung overhead circuit break panel to dent the forehead and the absence of a control yoke. The side-stick control opens up the area immediately in front of the pilot and this space is utilised by a fold- away tray table and computer keyboard. To the side, the window frames extend quite low, much like on the Boeing 757, and offer a welcome addition to the peripheral vision. This, combined with the flightdeck’s positioning, gives the A380 an outlook belying its behemoth dimensions. There is not the sense of towering above the runway as from its double-deck compatriot, the 747. Seating position is paramount. This is not purely as a function of outside perspective, but also ensuring that the pilot is comfortably seated with their ‘control’ arm correctly positioned on the armrest to apply the subtle touch to the control stick. From the outset, Rob Ford emphasises that this is an aircraft to be flown by means of “adjustment” rather than large inputs. The flight panel and centre console speak loudly of 21st century technology. In addition to the large screens that have replaced dials on all modern types, there are keyboards, mouse buttons and track balls that interface with the multi-function and navigation displays. There is a point-and-click facility that is more reminiscent of a computer than an aeroplane, but is thoroughly instinctive and logical to use. Settled in, with Andrew Foxton busily programming at the aft instructor station, the time has come to start the four Rolls Royce Trent 972 engines and see what the A380-800 offers when free of Terra Firma. Lined up for takeoff on Sydney’s Runway 16 Right with a weight of 560 tonnes, Rob Ford enters the key data and the most striking factor is the relatively low speeds for such a large aeroplane at maximum weight. Spanning almost 80 metres, the huge surface area of the A380 wing employs new design concepts and manufacturing processes to ensure that the wing is as ‘clean’ and efficient as possible. This efficiency translates not only into lower takeoff speeds, but compared to the 747-400 it uses 17 per cent less runway to get airborne. Cleared for takeoff, the thrust levers are brought up to initially stabilise power at 30 per cent – yes, per cent. These Rolls-Royce engines have for the first time dispensed with engine pressure ratios (EPRs) as a power setting and employed the ‘metric’ equivalent. With power stabilised, the thrust levers are advanced through a series of detented ‘gates’ that are characteristic of Airbus aircraft. Set at maximum power the engines modulate to maintain the thrust with no corresponding movement of the thrust lever beyond its setting in the correct gate. Rumbling along the centreline, the A380 simulator provides all of the sensory cues to reinforce that this aircraft is at its maximum weight. The time to reach flying speed is further lengthened by the strong philosophy of derated takeoffs that exist with the type, even at such high weights. The reasons for this are diverse and range from lower maintenance costs to a reduced airport noise footprint. The lower thrust equates to lower fuel flows, lower exhaust gas temperatures (EGTs) and limits the significant gyroscopic loads on the main compressor shafts during rotation. These factors all equate to wear and tear and ultimately cost. Around 20kt separate V1 and rotate and I tentatively pitch the aircraft towards 12 degrees nose up, note a positive rate of climb and call for the wheels to be raised. It becomes immediately apparent that Rob and Andrew are right on the money in cautioning me against over-controlling. The aircraft requires only small inputs and a degree of anticipation that you would expect of an aircraft of this size and weight. Now is an appropriate time to confess to having had some trepidation about the side-stick. Having only known the Boeing yoke for my 14 years in airlines, my sidestick record was not good. One attempt at a friend’s Microsoft Flight Simulator after a Christmas barbeque went rather badly and resulted in me wanting to bend the stick past the limits of its gimbals. Fortunately, the real thing is tremendously intuitive and easy to fly. Quite simply, within minutes you develop a feel for the control inputs and the sense of ease in steering this enormous airliner. The fundamental challenge in adapting to the side-stick stemmed from the need to input only enough control to achieve the desired attitude and then RELEASE IT. There is no need to hold the control input in through a manoeuvre, you simply set it and then relax the input to neutral. The A380 will automatically trim and hold that attitude until you input the sidestick again to set a new attitude. As Rob Ford stated from the outset, you “adjust” this aircraft around the sky. Less is definitely more. A key Airbus philosophy is its ‘Laws of Protection’. A mantra to Airbus fly-by-wire crews, these laws incorporate a series of flight mechanisms that define the boundaries of the flight envelope and protect the crew from exceeding it in an unsafe manner. These protections are designed to prevent the aircraft being stalled, taken over-speed, over-banked or accelerated beyond the limiting speeds for flaps. The first example of this function occurred after takeoff when the normal act of flap retraction was ignored as the aircraft accelerated. On reaching 212kt, without any pilot input, the flaps begin the process of retraction to protect themselves from the stresses of excessive airspeed. The progress of the retraction can be followed on a schematic display in front of the pilot. With the flaps retracted we climbed out over western Sydney and flew a series of general handling exercises. The intuitiveness of the side-stick was really beginning to settle in by this time. The ease was aided by a flight guidance system referred to as ‘The Bird’ that indicates the aircraft’s trajectory, independent of body angle. If you place ‘The Bird’ on the horizon bar, you will maintain level flight with a minimum of effort. In the turn, there is no need to hold in back pressure or trim the A380 until the bank angle reaches 33 degrees. Beyond this angle, back pressure is required to be held in as a reminder to the pilot that he is beginning to enter a phase of flight beyond the everyday boundaries. At 67 degrees of bank, the aircraft refuses the request to bank any further regardless of control inputs. At both ends of the speed envelope, the A380 also draws a line in the sand. Maintaining level flight, the thrust levers were closed and the aircraft decelerated towards its lowest safe speed (Vls), through the amber warning bars on the speed tape towards the red indicator of the stall speed. With the thrust levers still retarded to the stops, the auto-protection is initiated and the engines spool up to maximum thrust and will not permit you to stall the aircraft. If you had the speedbrakes extended, the system would have retracted these also. Once the aircraft senses the side-stick commanding an angle of attack below the critical angle, the pilot regains direct control of the aircraft. It all seems too straightforward. Similarly, at the high speed end of the regime with thrust on and diving towards the red ‘barber’s pole’ of over-speed territory, the system allows a momentary overshoot into this realm before acting. Again, independent of thrust lever and side-stick position, the aircraft reduces thrust and pitches its nose up to return the A380 to a safe operating speed until the pilot’s actions once again indicate that he is heading in the right direction. In the early days of Airbus, these ‘Laws of Protection’ had been an area of some confusion for crews. Two decades have now passed and the logic they employ is better understood. As a first timer I was suitably impressed, no more so than when I was encouraged to stall the aircraft on final approach in the landing configuration with the thrust levers closed and full aft and roll input. We should have fallen out of the sky, but despite my best efforts the A380 powered up, limited my bank angle and carefully set the pitch attitude to recover. I entered a climbing spiral to safety on short final and the rooftops below gradually became more distant. Did it feel natural? No. Was it amazing? Absolutely! Repositioned at Sydney, we set about testing the A380’s engine out performance and handling with an engine failure on takeoff at V1 and the subsequent management of the event. As Rob Ford called “V1” the telltale swing indicated that one of the Rolls-Royce Trent engines had failed. The rudder input to keep straight was minimal and when Rob called “Rotate”, the nose was easily pitched to a slightly lower than normal 10 degrees up and the climb away commenced at a very acceptable rate. The engine failure turned out to be an outboard engine, which naturally induces a greater yawing moment, yet only moderate control input was required by virtue of the large rudder on the A380’s fin. The input needed for a failure of an inboard engine must be almost negligible, though this wasn’t experienced on the day. At a safe altitude and with the autopilot engaged, we set about addressing the engine failure. The Electronic Centralised Aircraft Monitoring (ECAM) pops up onto the central screens automatically in the event of a non-normal situation in conjunction with the appropriate system display. It leads the crew through the required checklists and actions in a very ‘user friendly’ manner as they set about resolving any failure that may occur – in our case the engine failure. It doesn’t replace the pilot’s need to remain unrushed and manage the situation, but what it does offer is the best available information to support the process in a very logical format. With the problem addressed, we restarted the engine and made our approach to land back at Sydney. 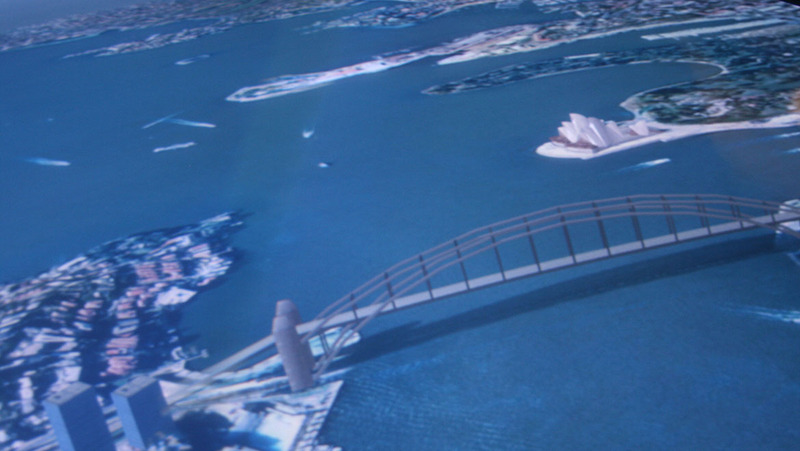 We took in some mandatory sightseeing over the harbour city and the visuals are just as you’d expect from a simulator of this generation, with the landscape not only accurately portrayed, but casting shadows as well. The approach itself was like much of the flight – very stable and controlled with minimal pilot inputs. In fact it all seemed to evolve very slowly as once again, the speeds for this vast aircraft are relatively low. At 360 tonnes, which is around 30 tonnes below maximum landing weight, the approach speed is only 135kt. As the runway loomed large in the window and the radar altimeter started to call out my height, I began to check the descent at about 40 feet as briefed by Rob. Looking ahead, the aircraft settled onto the runway with a minimum of fuss and I reached down to deploy reverse thrust. Interestingly, by virtue of the lower speeds and braking system, the A380 only possesses reversers on the inboard engines. Even so, we pulled up after a surprisingly short ground roll. The fun had come to an end. The date of my ‘flight’ was nearly two years to the day after Qantas had first received the A380 simulator. At the time, it had undergone its installation and motion checks in record time. Currently the simulator is rated as an interim ‘Level C’ device reflecting that it is a new type on the register. The highest level of qualification for full flight simulators is ‘Level D’, allowing endorsement on type with ‘Zero Flight Time’. 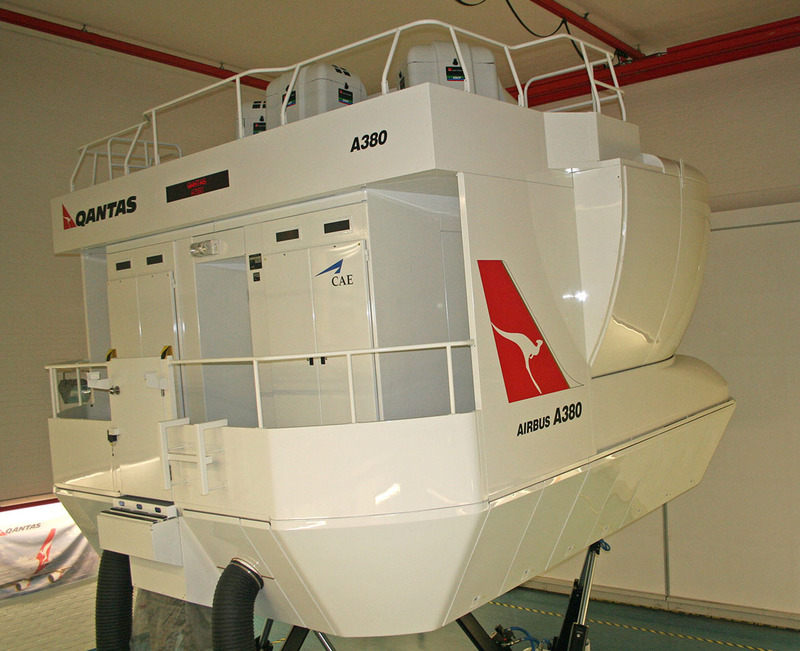 The simulator at Airbus’s Toulouse training facility received this accreditation in March of this year and on present projections, the Qantas simulator will become Level D early in 2009. 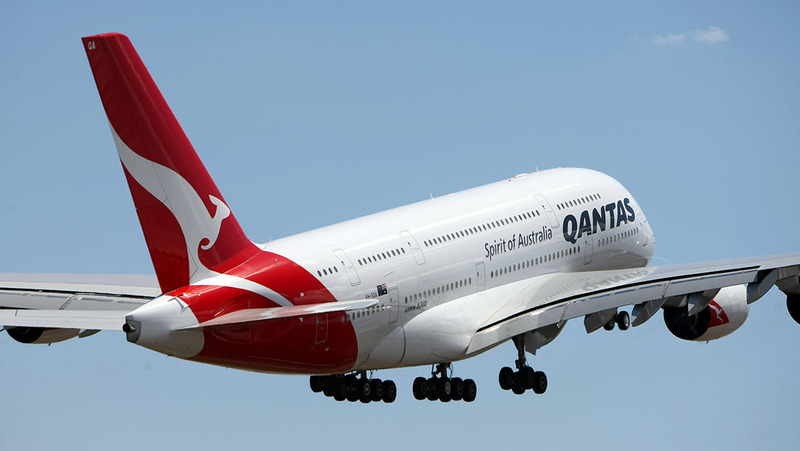 At the time of writing, 66 Qantas pilots had been trained on the A380. Some of these were waiting to complete their sector training, while all the training captains and some line pilots had already completed this line flying with Airbus out of Toulouse. There are two training paths for crews, depending on whether they have flown the Airbus A330 previously. 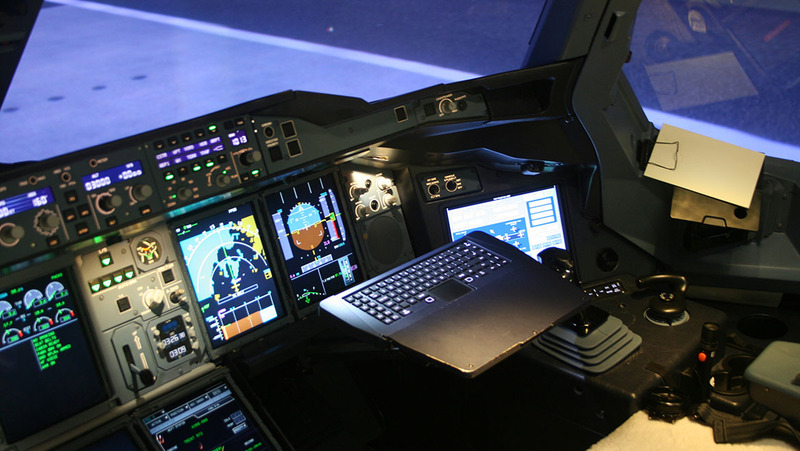 Initially, all crews are required to undertake computer based training on aircraft systems and performance as well as an emergency procedures training day. 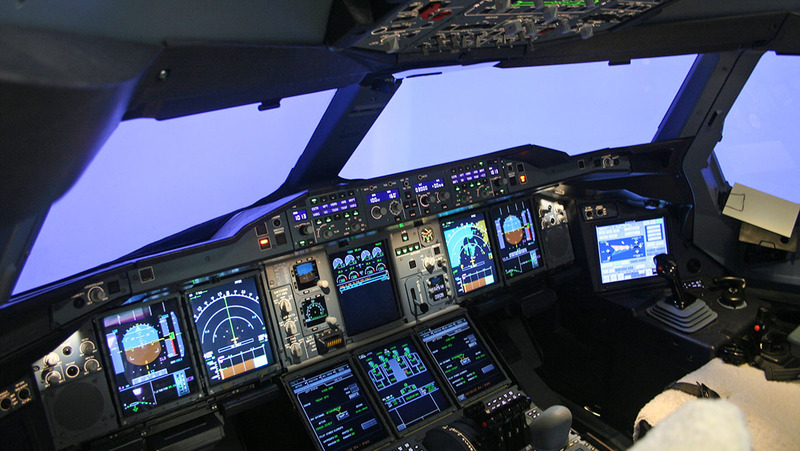 The full course for those without previous A330 experience involves 11 multi-function training device (MFTD) sessions in the flat screen procedures and systems trainer. This is followed by 10 full flight simulator sessions with additional base training and a session of low visibility operations. For those converting from the A330, the course is known as a CCQ, or ‘Cross Crew Qualification’. 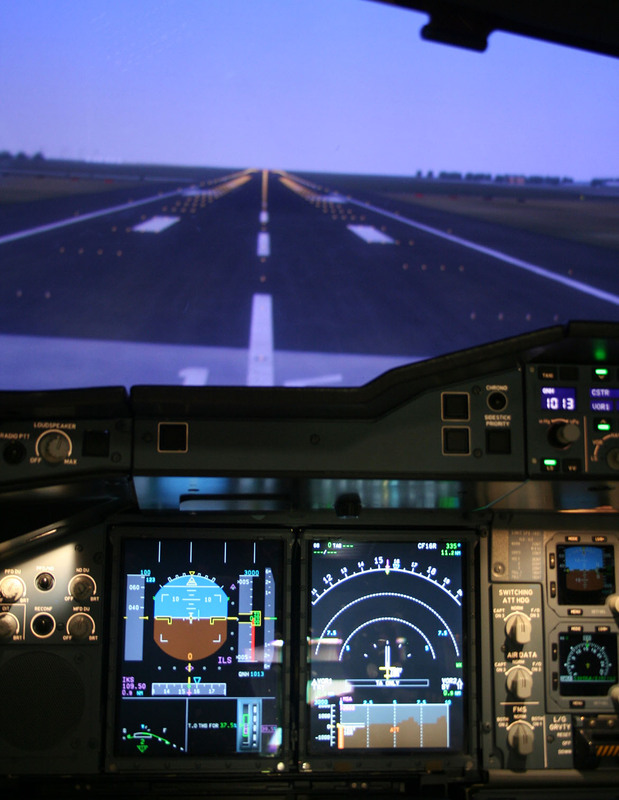 The training is common to the full course with the exception that there is a reduction in MFTD sessions to five, while six full flight simulator sessions are required. The subsequent line training in the aircraft comprises six training sectors and a final check over two sectors. With the arrival of the A380 on the Qantas flightline, these crews are undoubtedly keen to start to put their thorough training into practice. The arrival of the Qantas A380 in our skies has created a decided buzz. I consider myself very fortunate to have had the opportunity to experience a flight in the simulator of this amazing aircraft. There has been a great deal of thought in the design of the flightdeck and systems to present a pilot-friendly workplace. Its quieter noise footprint is sure to be popular in an ever more environmentally conscious and curfewed community. For one Boeing pilot, the mystery of the ‘Laws of Protection’ were dispelled and replaced with a genuine sense of respect. This mammoth of the skies is equally at home at high altitudes or low approach speeds and is guided around the skies more with finesse than force. Its flight characteristics seem to ooze simplicity and are ably supported by its systems and redundancies. Even the side-stick is no longer a spectre. It is intuitive, simple and all about subtlety. For me there is absolutely no temptation to bend this side-stick past the limit of its gimbals. This feature article originally appeared in the November 2008 edition of Australian Aviation magazine.